NOTE: Little League recently updated the league age cutoff. 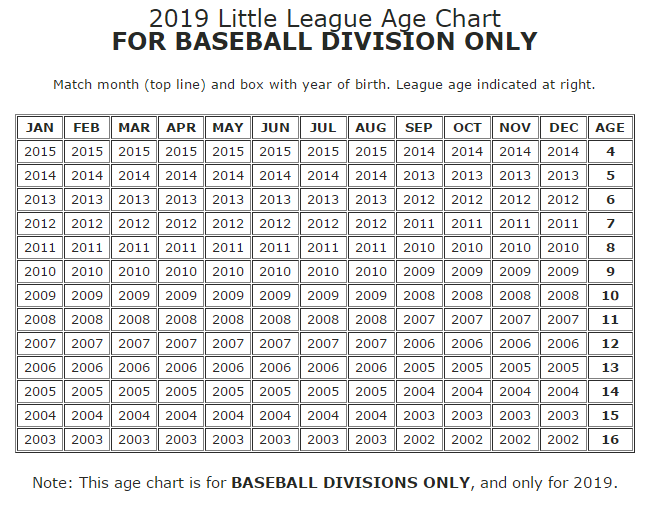 To determine your child's league age, please see the chart below or click here. The league is organized into division groups for the spring season: Beginners, Minors, Majors, and Juniors. Within these division groups, individual divisions are formed based on age, skills, player evaluations, and in some cases, as mandated by Little League regulations. The table below describes each division and the various league ages and qualifications that would place a particular player into that division. All player placement decisions are at the discreition of the LSLL Player Agents. The player agents also represent all player interests for the league, and parents are encouraged to contact them regarding division placement at or . Players league age 7 WITHOUT a prior season of T-Ball experience, at parent request and Player Agent approval. Players league age 7 with a sibling in this division, at parent option and with Player Agent approval. ALL players league age 7 who do not attend a tryout. Players league 8 with a sibling in this division, at parent option and with Player Agent approval. Players league age 7 who try out, have an acceptable evaluation score, AND are drafted. Players league age 8 who are not drafted into the AA division. Players league age 7 at parent request, Player Agent approval, who achieve an acceptable evaluation score, AND are drafted into the AA division. Players league age 8 who try out, have an acceptable evaluation score, AND are drafted. Players league age 9 who are not drafted into the AAA division. Players league age 9 who try out, have an acceptable evaluation score, AND are drafted. Players league ages 10-11 who are not drafted into Majors division. NOTE: Only players league ages 10-11 who were not drafted into the Majors division may be called up as replacement players to a Majors team. Players league age 12 who waive their right to play Majors. NOTE: A formal Regulation V(e) waiver must be filed with the League by parents. Players so waived may not pitch in AAA, nor be recalled to Majors. Players league age 10 - 11 who try out, have an acceptable evaluation score, AND are drafted. ALL players league ages 11-12 who have previously played in this division. ALL players league age 12 who have not requested to play in AAA. ALL players league age 13-15. Players league age 13-14 who are also in 7th and 8th grade.